Five San Diego-area breweries have been burglarized in less than two weeks, and evidence on social media lead some victims to believe the same suspect is responsible. A piece of plywood now covers the point of entry used to break into Longship Brewery. It was the first of two breweries burglarized last Friday morning in less than an hour. The two breweries are just five miles apart. "Probably thought he could get away with it," Longship Brewery Owner Dan Jachimowicz said. Jachimowicz showed NBC 7 security video of the suspect. In the video after hours, the burglar watched and waited outside the brewery for exactly six minutes. "Checking for alarms. Checking for different signals he should walk away,” Jachimowicz said. Satisfied it was safe, the suspect broke a lower window, crawled through and 20 seconds later was gone. So was the cash register. "He definitely knew what he was doing or at least what he wanted," Jachimowicz said. Forty minutes after that, and five miles away, there was a second burglary at Serpentine Cider. A lower window was smashed and the night receipts were stolen. The suspect looks the same to Jachimowicz. "Just the overall stance, the gate, the way the person moved, the clothing," Jachimowicz said. The three other breweries targeted since March 28 include Gold Coast Mead on Oceanside Boulevard, Barrel Harbor on Pioneer Avenue in Vista, and Black Plague Brewing in Oceanside. “It’s definitely scary. It’s interesting he is targeting breweries. Historically, messing with people's beer doesn't turn out too well,” Jachimowicz said. Black Plague posted a video of the suspect on its Instagram page. Once again, the burglar is hooded, masked and gloved. The suspect enters through a smashed lower window then makes off with the cash drawer. No video from Gold Coast Mead was available but the owner shared a picture of the smashed lower window from which the suspect got in. The break-ins happened in three different law enforcement jurisdictions. So far only the brewers are connecting the crimes. "It’s only a matter of time before we all share notes and something happens," Jachimowicz said. He suspects the burglar came to his brewery and Serpentine Cider Thursday night because both were packed with customers, the busiest night of the week. He is checking earlier recordings to see if he can prove his theory. Breweries, like bars, are often times a cash business. Victims say that is why they are being targeted. So far, the equipment used to make the libations has not been touched. 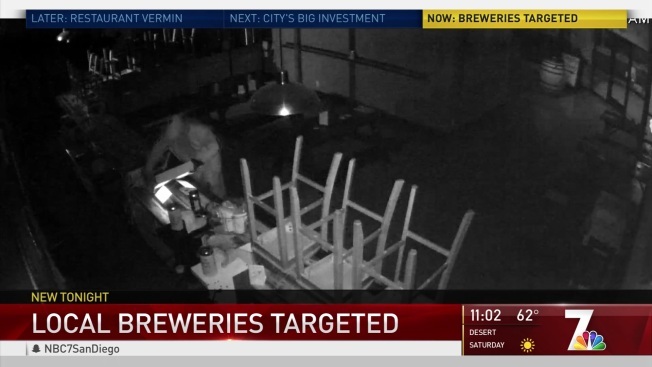 As of Friday, Oceanside Police have confirmed that the vehicle used in the Black Plague Brewing burglary is the same one used in the Electric Brewing Co. burglary. The vehicle used is described to be a 2015-2017 White Jeep Patriot.